From maritime Canada to the Carolina backcountry, New England to the Illinois prairies, Protestants in British North America and the new United States influenced by the evangelical awakenings of the eighteenth and early nineteenth centuries were known as the "people called New Lights." This occasional blog features news, reviews, and research notes, along with dispatches from the archives and edited transcriptions of notable, obscure, and downright quirky manuscripts chronicling the religious beliefs, practices, and experiences of the people called New Lights from 1730 to 1850. Stephen Fay (1715–1781) is hands down my favorite character in Darkness Falls on the Land of Light. Eclectic and pugnacious, he’s a paradigmatic representative of the people called new lights. The Westborough, Massachusetts, layman—along with his extended family—promoted the most radical innovations of the Whitefieldian revivals in New England. After passing through a wrenching conversion experience during the fall of 1742, Stephen starting railing against what he believed were the unedifying sermons of Congregational minister Ebenezer Parkman. His nephew, Isaiah Pratt, experienced visions of the Book of Life; his father welcomed the controversial itinerant preacher James Davenport into his home; his wife and sister-in-law exhorted among mixed audiences of men and women outside the Westborough meetinghouse; and other family members began attending religious meetings in the neighboring town of Grafton. Then, during the spring of 1743, the Fays appealed to Elisha Paine, arguably the most incendiary lay preacher of the era, to visit Westborough. Parkman was an energetic supporter the revivals and an unusually tolerant clergyman. For months he had labored quietly to resolve his differences with the Fays. But he wasn’t about to take this latest threat to his ministerial authority lying down. 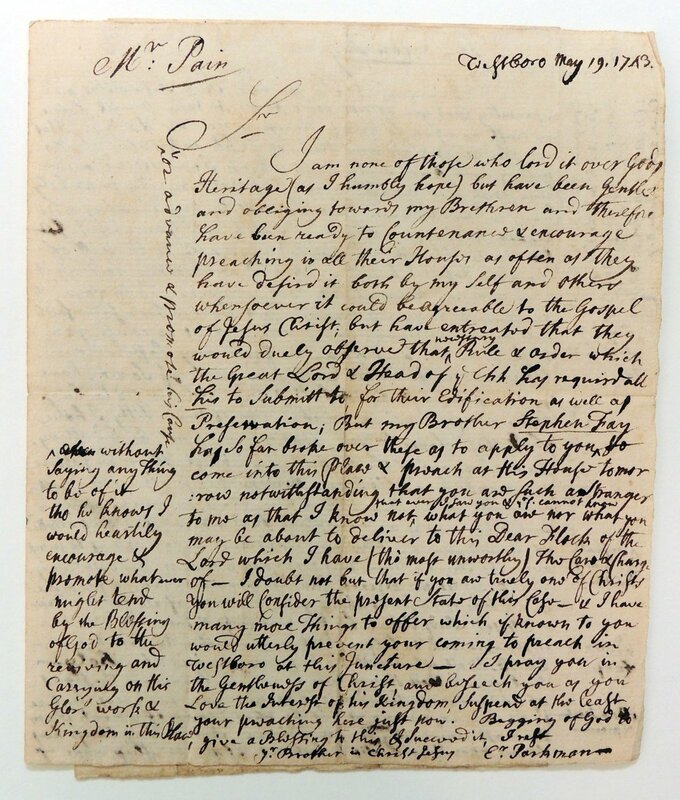 In the two stern letters presented below, Parkman warned Paine to stay away from his parish and exhorted John Fay, Stephen’s father and a deacon in the Westborough church, not be “led astray” by the interloping itinerant. Indeed, Parkman’s missives are especially valuable for the powerful equestrian metaphors that anchor his arguments. Like many of his colleagues, the Westborough minister envisioned the Congregational gospel land of light as a series of bounded ecclesiastical enclosures. Itinerant preachers such as Paine threatened to break down these spatial boundaries by enticing lay men and women to “jump over the Sacred Fence” and “Leap over Christs Wall wherewith he has encompassed this holy Enclosure.” Hankering after “other pastures,” the free ranging Fays heralded the emergence of a new breed of religious seekers who would come to dominate the American religious scene by the turn of the nineteenth century. As I argue in Darkness Falls on the Land of Light, the Fays “refused to be bridled” (376). Several family members departed Westborough and migrated first to Hardwick, Massachusetts, and later to Bennington, Vermont, where they helped to organize Separate, or Strict Congregational churches. Stephen, who emerged as the proprietor of the famed Catamount Tavern, eventually abandoned the Congregational establishment altogether. Papers, 1707–1879, box 3, at the American Antiquarian Society in Worcester, Massachusetts. The illustrations below appear by permission. For the complete story of Stephen Fay’s fascinating journey from Congregational insider to spiritual seeker, see Darkness Falls on the Land of Light, 374–379, 386, 394–395, 403–404. On the career of Elisha Paine, see C. C. Goen, Revivalism and Separatism in New England, 1740–1800: Strict Congregationalists and Separate Baptists in the Great Awakening, second ed. (Middletown, Conn., 1987), 115–123. For two excellent discussions of the challenges posed by itinerant preaching, see Timothy D. Hall, Contested Boundaries: Itinerancy and the Reshaping of the Colonial American Religious World (Durham, N.C., 1994); and T. H. Breen and Timothy Hall, “Structuring the Provincial Imagination: The Rhetoric and Experience of Social Change in Eighteenth-Century New England,” American Historical Review 103 (1998): 1411–1439. Genealogical information on Stephen Fay and related family documents may be found by searching the online collections at the Bennington Museum. Image courtesy of the American Antiquarian Society. I am grievd to See you under Such Infirmitys, and especially that you do not come to me to take Counsel before you rush on upon So great Things as you are doing. Has not the Great Lord and Head of the Church instituted the Ministry and Authority with which I am vested, and have you not bound yourself voluntarily in an holy Covenant with me, to own and submitt to my Teaching and Instruction & to my watch and Government while I teach and Guide agreeable to the will of the Lord Jesus Christ? Compare Ezekiel 33:7 with Chronicles 3:8, 1 Samuel 4:13 middle Clause, Romans 11:13 last Clause, Hebrews 13:17, 1 Timothy 4:11, Titus 2:15, 2 Corinthians 10:7 to 14, John 10:1, 2; Jeremiah 2:25, Canticles 2:15, 1 John 4:7. Am I, Dear Brother, Lording it over you; or have I not rather abounded in Love & Gentleness towards you? But have I been so unfaithfull to our great & glorious Lord & to you and your Souls Interest as to cause you to forsake me and go away from my Pastoral and Affectionate Care over you? If So why have you not been so faithfull to me at least as to lay before me Conviction of it? Galatians 5:22, Ephesians 4:3, Canticles 1:7, 8. Out of tender Pitty I have Sent these Lines to you, that you may not be led astray. Do not run out of the Fold of Jesus Christ; This is his Pasture; you may be sure of it; don’t hanker so after other pastures as to take off your Heart from this; tho it be mean compard with other[s] yet if we are willing to be where Jesus has allotted us, he will give his Blessing; we shall not want. Psalm 23:1. Don’t be so impatient as to jump over the Sacred Fence, but wait upon him in his own way; And pray let me beseech you for your own sake & for mine and the Sake of the souls about you, but most of all for our Dear & Blessed Lords Sake & his precious Cause & Interest, dont be instrumental to help any Stranger either to break down or Leap over Christs Wall wherewith he has encompassed this holy Enclosure: Nay if there be ever so Seemingly the signs of an Eminent Servant of Christ, yet you may not venture to let him in as a Teacher, & preacher among us but by that Door of which I am tho most unworthy the Guardian. Brother Fay, Christ has Set me upon these walls to look out. If you are asleep, wake up.